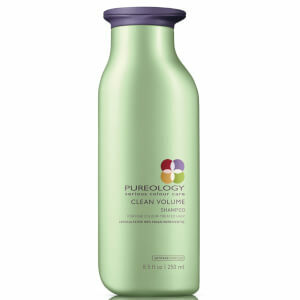 If you desire stronger, long looking hair, you need Pureology Strength Cure Shampoo. The rich foam cleanser uses Pureology's Antifadecomplex and Asta-Repair technology to create split-end free hair. I have fine,highlightedhair and not much of it - so am constantly in the lookout for damage control and anything that can prevent knots - and therefore breakage. This shampoo has quickly (two weeks) improved the condition of my hair. Have been using for about a week now, don’t need much for it to lather up well, but like others have said the smell is not the best hence the 4 stars. I have slightly oily hair so maybe that was the wrong choice-anyway, I didn’t like it. Made my hair even more greasy than before wash. Smell is not pleasant either. Leathers well if anyone interested. Can not recommend. Very good shampoo, only used a few times but my hair already feels alot softer and shinier. The conditioner however is not so great, perhaps its too much protein combined with the shampoo for my hair as it felt rough and very unmanageable after?! I personally like this shampoo accompanied with a nice hydrating conditioner. The Mask in this range is also very good! I have blond, long and damaged hair due to straightening. I also have quite thin hair. When my all-time favourite brand stopped producing their products I had to search for a new shampoo and conditioner. This was horrible! A lot of shampoo made my ends dryer, fluffy, uncontrollable and more greasy at the roots. I have been using PUREOLOGY Strength Cure for only a week now and wow! I can see and notice the difference immediately. It's amazing! My hair feels so soft, but totally not greasy! Looks way better and healthier. You also don't need much shampoo and it lathers very well. It really does the job for my hair and I will definitely buy this again! After researching and trying out pretty much every expensive and cheap shampoo this is by far the best one i have used , smells amazing and my hair isn't event greasy after 3 days of washing and going on the sunbeams being super hot and sweaty !! I have dark hair, was permed over a year ago so its kind of all over the place atm, i bought the conditioner as well and they have both lived up to what i expected ! I absolutely love this shampoo. I have tried many many brands, including some of the most expensive ones. This is a lot better than Kerastase and Redken, in my opinion. It smells Summery and fresh, is sulfate free yet it lathers incredibly well... Leaves my hair very clean, soft, shiny and just lovely. I am not sure if it can really repair hair (I don't think any shampoo can do that) but it makes my already good hair even better. It definitely makes my hair look and feel even better, super healthy and just perfect. My hair is long, brown, I sometimes dye it and it is medium textured, mostly straight but with a slight wave. Excellent product, I am on my second bottle and will continue to buy. This says a lot, considering I don't often repurchase shampoos! I really like this shampoo it makes my hair feel really clean and thick, will buy again.